HADAS held its 22nd AGM on May 18 at Hendon Library, with some 75 members present. The Chair was taken by one of our longest standing Vice-Presidents, Mrs Rosa Freedman, who recalled with pleasure our 21st birthday party last year at which, when she was Mayor of Barnet, she had been guest of honour. In his annual report Councillor Brian Jarman detailed the various changes in the Society's officers and administration which had taken place during the year - Brigid Grafton Green's retirement as Hon. Secretary last October and Brian Wrigley taking over that office; Ted Sammes retiring this year as Vice-chairman a new post of Hon. Member­ship Secretary being created and ably filled by Phyllis Fletcher; and various research and field groups replacing a single research committee. Victor Jones, our Hon. Treasurer since May 1982, presented his first report and accounts on which a lively discussion followed, ranging from why we endured bank charges to how profits from publications could best be recorded. The Society4s membership at March 31, 1983, was 407 - as against 433 last year. The Hon. Treasurer foresaw a probable need for a rise in the subscription at the start of the next financial year (that will be on April 1, 1984). All members were therefore invited to brood on this problem until such time, next autumn that a Special General Meeting may be called to discuss it in detail. Our Hon. Secretary, Brian Wrigley, introduced a report, circulated at the meeting, on the activities of the Prehistoric, Roman and Docu­mentary Groups; and on the establishment, under the co-ordination of Elizabeth Sanderson, of local field groups; Bill Firth followed with a few words on the work of the Industrial Archaeology Group, mainly concerned at the moment with aviation history. 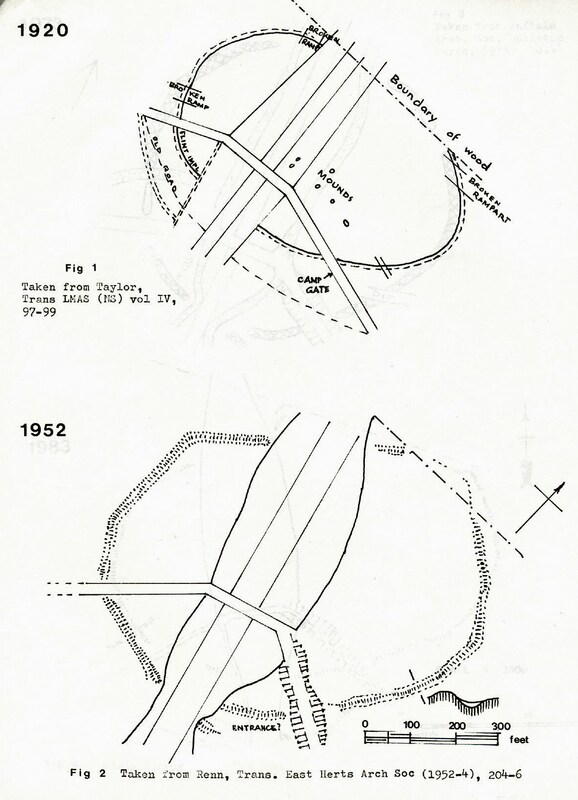 Brian Wrigley also dis­cussed possible excavation plans for the coming year. Permission to dig at the Hadley earthwork in June or July has already been sought from the Management Committee of Hadley Common. Anyone interested in taking part should ring Brian WFigley on 959 5982 for further details. All offers of help will be warmly welcomed. Green; Miss D P Hill; Sir Maurice Laing; Andrew. Saunders, MA, FSA; Edward Sammes; E E Wookey. Under Any Other Business Andrew Selkirk drew attention to the recent grant by the GLC of £250,000 for professional archaeology in Greater London (see further report below) and suggested that HADAS might put in for something towards expenses for e.g. accommodation, obtaining radio carbon dates, etc. Bill Firth asked that the Society should consider producing an annual journal or proceedings, in addition to the monthly Newsletter, Alec Jeakins wanted lecture on West Heath, drawing the subject together and bringing members up to date with the latest post-excavation work. Brigid Grafton Green commented on the marvellous change which the Roman Group had wrought by paint and elbow grease in the appearance of our accommodation at College Farm. Business over, Percy Reboul produced an audio-visual treat, helped by Liz Holliday as projectionist and Christopher Newbury, who provided some magnificent sound equipment. This was a replay, with slides, of a lecture on Byegone Hendon, first given by our founder Themistocles Constantinides, on Nov. 2, 1963, when HADAS was two years old and had a mere 100 members. One of "Mr Constans” great hope was that HADAS would find, by excavation, evidence for Saxon, Hendon. How he would have reveled in the discoveries at Church Terrace of the Saxon ditch with grass-tempered pottery and our fine spiral-headed Saxon pin. In the February 1983 Newsletter we mentioned the professional rescue archaeology service which the GLC was proposing to set up for the outer London Boroughs, in which the Borough of Barnet would have a part. Prior to 1972 only two full-time archaeological posts carrying out excavation work existed for Greater London: Both were based at the then London Museum. All other excavation work was undertaken on a part-time voluntary basis, partly guided by LAMAS and other organisations. 1972 saw the foundation of professional units in the London area, drawing money from a wide variety of sources. Of the 32 London boroughs, however, only 22 were covered by the full-time teams. The GLC, through its Historic Buildings Panel, felt that this situation was untidy and over the past two years discussions for reorganisation have taken place. This was also important in view of the changed attitude of the DOE to funding excavations. April 1, 1983, saw the official start of a new organization, which will endeavour to cover the whole of the GLC area for rescue archaeology. This London Archaeological Service was officially launched at a reception held in County Hall on April 20 last. I was privileged to attend as a representative from the LAMAS Borough Secretaries committee (on which I serve as a representative of HADAS) and the Working Party for London Archaeology. The new employer will be the Museum of London, which will receive the funds from the GLC (£250,000 per annum, as Andrew Selkirk mentioned at the AGM) and will control both how the funds are used and the archae­ological effort. Money will still be needed from other sources. Beneath the Board of Governors is the Director of the Museum, and then the Archaeology Officer, Harvey Sheldon (already an old friend of many =LS members). 6. Kentish boroughs, covered by the Council for Kentish Archaeology. The Inner and North London Unit, which deals with area 2 above, will be headed by David Whipp. No major increase in staff is envisaged, thus a greater activity is not possible. What the new set -up means for the Borough of Barnet is that we shall have access, should we require it, to a professional on a firmly established basis. To discuss the new arrangements it is intended to hold a meeting inviting two representatives from any interested society, plus local museums. No date has been fixed for this meeting. The new organisation virtually marks the end of the Working Party for London Archaeology, but there will still be a. need for a body to speak in an unbiased manner on matters of policy and to represent the London area on CBA Group 10. Saturday, June 18. Our visit to Northern Essex will include a short stop at the Bartlow Hills, those impressive Roman barrows so often referred to, so seldom visited. Hedingham Castle, one of the best-preserved Norman keeps in Europe, is our next stop, followed by a visit to a farm at Guestingthorpe where deep ploughing turned up many Roman artifacts, leading to the excavation of an unusual industrial site. There will be time to explore the village of Castle Hedingham and, per­haps, to stop briefly at the Iron Age hill fort of Wandlesbury. If you wish to join the party, please fill in and return the enclosed form as soon as possible. Please read the forwarding instructions carefully. DO NOT SEND TO DOROTHY NEWBURY AS SHE WILL BE AWAY FROM JUNE 6. The Church of St Paul, on the Ridgeway at Mill Hill, celebrates its 150th anniversary this month. A varied programme of events begins with an opening celebration service, taken by the Bishop of Edmonton, at 10 am on Sun. June 26, and ends the following Sunday with a United Evensong. A 'trail' through the churchyard, an Open Day at St Pauls School, a lecture on William Wilberforce, a Flower Festival, organ recitals and an historical exhibition will be other events. HADAS has been invited to take part in the exhibition; to be held in St Paul's Church Hall from June 26-July 3. Tessa Smith, helped by June Porges and Phyllis Fletcher, is planning a display using both objects and photographs (details of times the exhibition is open from Brigid Grafton Green, 455-9040). This year sees the 150th anniversary of the consecration of the Church of St Paul Mill Hill. It was built in the first part of the 19c by William Wilberforce, the great champion of the slaves, who intended it to be his own private chapel. His strenuous campaign against slavery and his untiring labours in other directions for the betterment of his fellow men had weakened his physical resistance. He retired at the age of 67 to Highwood, in Mill Hill, where he had acquired a small estate on which he intended to spend the rest of his days in peace and quietness. He was a devout Christian and was disturbed to find that the nearest place of worship to his new home was St Mary's, Hendon; he was also distressed that his poorer neighbours in Mill Hill village were being deprived of religious solace and pastoral care by reason of the great difficulty they had in attend­ing service at Hendon. He resolved to build his own.Great opposition to his plans was voiced by the Vicar of Hendon, the Rev. Theodore Williams, who accused Wilberforce of using his public position to influence the Bishops to agree to the church being built; and bitter exchanges ensued. The Church Commissioners, however, did give their assent and the Church was erected. Legal wrangles on the patronage delayed the actual consecration, but eventually it was consecrated on Aug. 8, 1833. Unfortunately, owing to increasing illness, Wilberforce had been compelled to leave Highwood and reside with one of his two sons. He died ten days before the Church was consecrated, and was buried on Aug.5th , 1833, in Westminster Abbey, near his Parliamentary colleagues of many years, Pitt and Fox. The 150th anniversary has, thus, another significance - it is also the anniversary of the death of the church's great founder. The outstanding feature of the Church is the East window; which con­tains a large, beautiful painted panel of the Death of Christ,. Mourned by the three Maries. This was painted by Charles Muss, leading painter on glass of the 19c, and is the only known example of his work signed by him. The Church has close associations with the Middlesex Regiment and houses eight Colours of the Service Battalions of the Regiment. In. addition there are several memorials to regimental members. *Note: A History of St Paul's Church, by H. Malatratt, price £1, will be on sale during the celebrations. Members who contributed to the raising of .the Mary Rose Tudor warship through contributions at the last Minimart may like a progress report on the Trust's activities. 'On Dec. 8, 1982, the Mary Rose was finally dry-docked in No 3 dry ' dock, Portsmouth Naval Dockyard - only a short distance from HMS Victory, Nelson's flagship. It was a home-coming, because the Mary Rose would, in 1509-10, have been built within a stone’s throw of No 3 dry dock. Although the dock is nominally 'dry,' in fact continuous wetting of the hull timbers is being carried out by pumps. Archaeological work on the hull is continuing, with many operations that will ultimately result in putting back 3300 timbers removed during the years of underwater excavation. In 1984 it is hoped to open a full-scale display of objects from the Mary Rose, in buildings close to the hull itself (perhaps a possible HADAS outing for 1984?) Already in 1983 visitors will be able to glimpse Mary Rose, for they will be able to pass over a footbridge spanning the dock. Mary Rose Trust, Old Bond Store, 48 Warblington Street, Portsmouth P01 2ET. This short handbook breaks new ground for the Shire series and should prove invaluable to teachers, many of whom will already be familiar with other titles in the list. Mr Dyer, general editor of Shire Books, who has experience of teaching children from 5-18 years old in schools and Further Education, is well aware of the pitfalls and temptations which confront the teacher of archaeology at these levels: his con­viction of its usefulness as a school subject does not blind him to the difficulty of fitting it into the overstuffed school timetable, especially at Secondary, level. However, having conceded that if it is taught in its own right, then it has to justify its existence. It has to be examined he devotes six pages to outlining the available external examinations. This section is admirably detailed; anyone planning to introduce the subject to 11-18 year olds should carefully weigh the absence of CSE Mode 1 Exam­inations, the cost of text books £15 per head + £20 per head on library books at A Level), against the undoubted educational value and fascination of archaeology. This the most sobering chapter. The rest of the book is warmed by the author's personality and full of excellent advice drawn from his contact with children in actual classroom and field conditions. The notes on Visual Aids and on sources of information are invaluable, chapters on Field Visits, Museum Experience, Excavation and, in particular,. Experi­mental Archaeology are full of useful advice and there is an excellent basic library list for teachers at the end of the book. The reader is constantly aware of Mr Dyer's grasp of essentials. The possible chronological confusions of topic work at the junior stage do not worry him. Time lines will keep some degree of order and in any case few children develop a sense of time before the age of twelve. Field walking is best reserved for small 'out of school' groups. Abusing the system with a group of unruly children often prevents legitimate workers from visiting the fields! All this information is lucidly presented in compact form. excellent booklet has plenty to say on that subject. Note: copies of this booklet and others in the Shire series be obtained from Pete Griffiths, 8 Jubilee Avenue, London Colney, Herts AL2 1QG (61 23156). ROMAN GROUP. As already announced (Newsletter 146) the Roman Group will be visiting Colchester Museum on Sat. June 11. Because this is a behind the scenes Museum visit the maximum number is 15. A few places are left, and if you are interested, phone Tessa Smith on 958 9159 for further information. North; 'Margaret Thatcher, Finchley; and Sydney Chapman; Chipping Barnet), urging them to press for changes in the Public Records (Amend­ment) Bill, a measure which would have affected many documentary researchers. It had already passed the House of Lords and was due for second reading in the Commons on May 13. As it happened, that was the very day of dissolution of Parliament so this particular Bill was "lost." However, we shall need to watch in case it is introduced in the same form again. The intention of the Bill, at which no one can cavil, was to passthe records of the Registrar General (births, deaths and marriages) tothe Public Record Office, so that Registrars would no longer have to spend time showing them to anyone who wanted (and at present has the legal right) to consult them. It was the method, not the intention, which was worrying. There was a second, even deeper worry. This was not part of the Bill, and was therefore the more difficult to oppose. During the debate in the Lords, the Lord Chancellor made it abundantly clear that research -workers wanting to consult the Registrars records at the PRO should expect to pay a fee for doing so... The figure of £10 per day was mentioned, although outside the House a figure of £20 was being bandied about. Were this to come about it might sound the death-knell of local history research as we know it. For one thing, it would not be long before the PRO would say ‘It’s unfair to charge for looking-at the 'Registrar's returns and not to charge for the Census returns and before you knew where you were you would find it cost up to £20 a day to examine Charles II's hearth tax returns, Edward III's feet of fines or a Clutch of'19c enclosure maps. 'Once a fee is introduced for one class of document, it will soon apply to all. HADAS member ANN KAHN Sends us details of an Exhibition of Archives, called The Common Chronicle, which takes place at the Victoria and Albert Museum from June 1-Aug 31. It brings together for the first time the finest archival material that has come into the possession of county record offices, and will range from the Saxon countryside to the slums of Victorian Sheffield. The opening will coincide with the publication by the Association of County Archivists of a discussion paper on national archives; which will point out present inadequacies in looking after what is rather grandly called our written heritage and will suggest ways of improving them also coinciding with the exhibition will be a one-day conference for record users at the V and A on June 25. It will spend the morning discussing the discussion paper, while the afternoon will offer a choice of still more discussion or of visiting one of eight record repositories, including the British Library, the National Monuments Record and the GLC Record Office, Further details from BALH, 43 Bedford Square, WC1. I reported in the March Newsletter the setting up of field groups in Finchley and Edgware districts. Now another group has been formed in the northern part of the Borough, where 17 Sites are currently being watched. Congratulations to the Roman Group for having put into print (Newsletter 146, .April. 1983) what I have been quietly saying since before Brian Robertson dug his series of trenches in 1967-8. We none of us know the age of any footpath but on the earliest Ordnance Survey maps Hendon St Mary's Church certainly had its share of them. At least five can be seen and of these what is clearly a long-distance path can be traced southwards right back to the Edgware Road somewhere about Cricklewood Broadway; and in the other direction across Sunny Hill Fields to Copt Hall. It is not difficult to extend this up Hammers Lane along a short length of the Ridgeway and at the Forge across the fields (by footpath) to the end of Hendon Wood. Lane. Such a route would have avoided much of the damp clayey plain area between Cricklewood and the bottom of Brockley Hill.The suggestion of such a route does not preclude Brian Robertson's road being another branch or loop. Let us be clear in our minds we are not looking for a major route but one linking or branching to settlement sites. The Roman sherds of pottery for Church Terrace, Hendon, are late Roman - 3c-4c - and whilst Ralph Merrifield suggested that they might have come from a religious site, there could have been a settlement as well in the area, as evidenced by the material from The Grove, Hendon, and the Sunny Gardens burial urn. One should perhaps discount the gold coin from the area and also the problematical piece of tessera. Brian Robertson's stretch of road could be connected in some way to Ashley Lane, itself a very old route. I would like to suggest that close to where he dug his final section, at the end of Archfield Allotments, there was a farmstead, possibly just to the east of that point. Of course we also use illustrations. These should be A4 size, line only, clearly drawn and, if possible, with letraset headings/ captions. Anyone in doubt about illustrations' is asked to ring the Editor first to discuss the problems. Despite the heavy rain in the .morning, the lecture room at the .museum of London was packed by 54 HADAS members listening to an absorb­ing lecture preliminary to the walk round Roman London. Fortunately the weather had cleared by the time a quick lunch had been taken, and the Roman Gallery of the Museum inspected. Setting out smartly in two parties, we went into the vault under the modern road at Roman Wall, opened up for us to see the west gate of the fort where the addition of the city wall to the earlier fort is so clearly visible; then on to where the junction of the city wall with the fort is to be seen, to the Mithraeum to the site under excavation at Fenchurch Street - various levels; mud and other walls. ; various earths -'black earth, red burnt earth; miscellaneous wells square Roman ones, a round Victorian one; a cesspit. By this time we were running well past schedule, but although there was a distinct falling off, the hardy persevered to the last Tower of London section of the Wall, eventually returning to fetch cars from the long-closed Museum, and to extricate Vice-President Eric Wookey, patiently awaiting collection in the nether regions of the Museum , car- park. - dangerously reminiscent of the long-lost Egyptian archaeologist who was discovered years later in a mummified condition in the Valley of the Kings. A very well-spent day and our thanks to Ted Sammes, who arranged it, and to the Museum staff. As a footnote to our City walk on May 15, here is news of a day of lectures on London, called "London: the First 2000 Years" which will take place on Sat. Oct. 8 next. This will be organised by Citisights, with the City of London Archaeological Trust, and will be held at the Museum of London, starting at 10 am and running through to about 6 pm. All speakers will be either past or present staff of the Museum, and HADAS members will know many of them - Ralph Merrifield, Jean Macdonald, Hugh Chapman, Gustav Milne are just a few names plucked at random. Subjects run from pre-history to the present day. Tickets (including coffee and tea, but not lunch) are £5 each and obtainable from P Herbert, Citisights, 87a Thurleigh Road, SW12. This organisation (of which HADAS is a corporate member) was founded last year and held its first AGM on April 23, in the Meeting rooms of the Zoological Society. It was a fairly vociferous occasion, with much comment and suggestion from the floor. Perhaps a first AGM, when an organisation is still feeling its way (and occasionally having to admit to teething troubles) must be like that. Most pressing problem the new association faces is, predictably, finance. It got off to a good start with a £3,300 one-off donation from the National Council of Voluntary Organisations and a handsome grant of £25,000 for its first year from the DoE. For this year the DoE grant will be £20,000 for 1984-5 it goes down to £15,000 and then the fledgling is likely to be on its own, and will probably need to find all its own feathers to fly with. Were expenses to remain in the same region as this year - heaviest items are office accommodation and staff - it was estimated that by the time the DoE grant goes it would cost £24 per annum per member to run the Association for 1200 members - the present membership. However, that supposition is full of imponderables which may change in the next few years, particularly if BALH is prepared to forego a central London address and use some voluntary help. There was a good discussion on the necessity for building some kind of regional structure into the organisation: this was one of many problems referred to a newly-elected 21-strong Council for action. For the time being the subscription to BALH remains at £4 for both individual and corporate members. Any HADAS member who wishes to support this worthwhile organisation - it will seek to do for local history what CBA does for archaeology - should write to the General Secretary, BALH, 43 Bedford Square, WC1P 3DP. A new exhibition has just opened at Church Farm House Museum, and will continue until June 26 at the usual hours. It is called "Getting There, and deals with three forms of transport in the Borough - road, rail and air. The material on show - photos, objects and models - comes from many sources, including private collections, the London Transport Museum and various transport societies. A note at the end warns us that owing to a change in the previously announced programme, the exhibition had to be mounted very quickly. However, the brochure suggests that it covers a wide and interesting range of topics and should be well worth a visit. WANT TO JOIN A SUMMER DIG? Many HADAS members know Dale Fort Field Centre, which is housed in a Victorian fort at the entrance to Milford Haven harbour, in the most south-westerly parish on the Pembroke coast. Even more will know it in a few months’ time, as.Dale Fort is the centre from which our 5-day visit to South Wales in September will be organised. He describes it as a most attractive site, and one where there is a lot to learn, archaeologically speaking. It is also very complex. While he was there the fort ditch and the environs of the entrance, which has been rebuilt several times, were being excavated. The ditches, some of them as deep –as 12-14 ft, are cut into rock, so that trowellers can see just where they are going. Finds from the site include flints (e.g. Bronze Age arrowheads) and some very grotty pottery. On the surface of a field on the landward side of the fort Paddy has picked up many struck flint flakes, cores and other artifacts. Centre, Dale, Haverfordwest,, Dyfed SA62 3RD. Victor Jones and I, assisted by Alec Gouldsmith, John Creighton and Joan Wrigley, have completed a survey of the line of as much of the ring of this earthwork as, is now identifiable. The result has been an accurate plot of the outlines onto the 1:1250 Ordnance Survey sheet; and a drawing of this on a smaller scale, is appended (Fig;. 4). It is clear from both the 1920 sketch plan, with its careful mark­ings of broken rampart in several places, and from the 1952 plan, with its almost complete outline of both slopes of bank and both slopes of ditch for a large part of the circuit, that there has been considerable erosion since those dates. It was therefore high time that an accurate plot of the remnant was made. An interesting point shows in the small SW segment. It, is clear from a measurement marked on the 1973 sketch, and from scaling off the distance in the 1952 plan, that the banks shown on these two plans are not one and the same, but are different features, both of which are now shown on our scale plan. My opinion is that it is the more northerly one, shown on the 1973 sketch, which is clearly the continuation of the line of the main ring. What, then is the other? If it was, in 1952, as clear and as long as indicated, it does suggest, that it was part of the earthwork, hence that there were multiple banks (?an entrance) in this area. 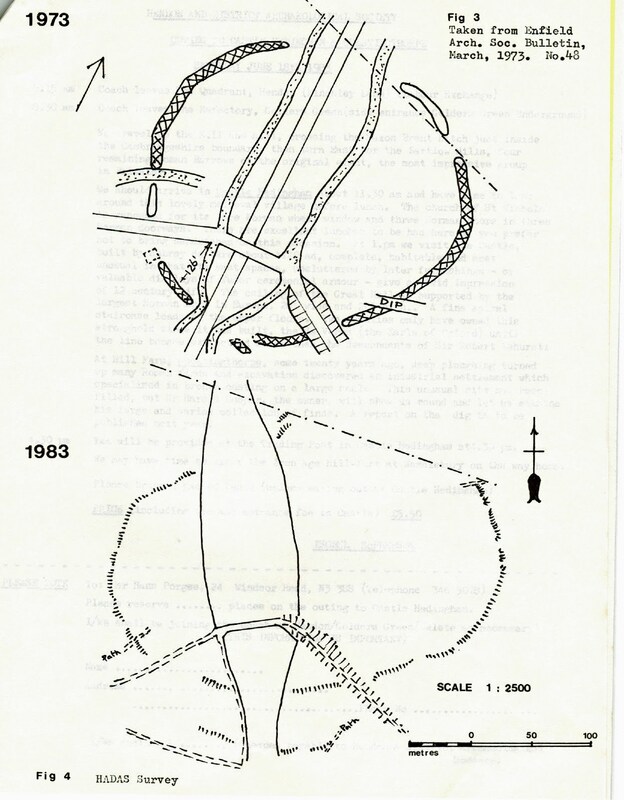 It seems (although they do not co­incide exactly when scaled off) that the more southerly feature in our 1983 plan is the remains of the feature drawn by Renn in 1952. It is now not nearly so plain nor so long as then shown; and is diffuse and un­certainly defined. Our opinion.is that it is, or is confused by, the remains of the old road shown in the 1920 sketch. Earlier maps showing the old road remains to be researched. Multiple banks, or at least some complexity that might suggest an entrance, are also possibly suggested in the small SE segment. Our plan shows a most southerly feature which may be the most southerly feature shown in 1952; however, we cannot reconcile the distance, when scaled off on the 1952 plan, with our findings. Both the small southerly segments have a general slope down more or less southwards to a very wet and soggy area, confused by trees and roots and numerous humps and bumps, whilst we are looking, for features no more than centimetres high the eye of faith needs to be guided by an agnostic skepticism. Dr John Kent (of the British Museum) and Geoffrey Gilliam Arch. Society to whom we are indebted for the help, have both confirmed that they have seen, from the ground, a crop mark in the past (when the land was under cultivation) an area outside the wood. We are trying to obtain an aerial photograph which is referred in Renn’s 1952 report. We are also grateful to Brian Warren of the Enfield Arch. Society, who gave us the benefit of his earlier research.